Advice for selling and maintaining a whisky, rum or wine collection as the executor, trustee or liquidator of an estate. If you are responsible for selling another person’s wine or whisky collection then you will want to ensure that it is maintained in the correct state so you can achieve the best possible price when it comes time to sell it. If the wine is currently in temperature controlled storage or in an underground cellar and you don’t have to move it any time soon then it is best to maintain that level of storage for as long as possible – DONOT store it in your cupboard at home or in any other location less than where it has been stored during its lifetime or you run the risk of losing the ability to attribute the previous provenance to the collection. You can rent wine storage space from a professional facility (such as National Storage) while you are organising the sale of the wine. If you must move the wine collection then get good photographs of the wine in its original storage and surroundings BEFORE you move it. Buyers of mature wine will appreciate seeing how it was stored and whether it has been stored in a passive underground cellar, a wine cabinet or in professional temperature controlled storage. If you can, locate any purchase receipts of the wine and of any wine storage equipment. If it has been stored in professional storage then invoices from the start through to the present or a statement from the storage facility indicating how long the storage unit was rented would be ideal. Do not allow the collection to be cherry picked by relatives (it is in everybody’s best interest to keep it together). It may not be worth an auctioneer’s time to deal with the remnants and you will get the best deal from them if they are handling the higher value wines and spirits. If original packaging is in good condition, keep it. Timber cases and sometimes even older style carboard boxes can be attractive to potential buyers and although it will not increase the initial value when it comes time to auction them off it can differentiate your wines against a competitor and attract higher bids. If the packaging is starting to rot or has been damaged it may not be worth preserving and can present a risk, so would be best to repackage it. Make sure you have realistic expectations. The wine and spirits may not be worth as much as you think. Not all wines are created equal and retail prices are not an indication of value, they are an indication of base value plus what the retailer needs to sell the wine to cover overheads. FACT: Most wines/spirits drop 40% in value as soon as you take them from a store. Remember, you want a realistic price that can be achieved in a short amount of time, the option of placing them on a website and waiting a year to achieve value may not be a realistic proposition. Make a list (CSV, spreadsheet is best for a large collection) for an auctioneer to value. In the list include for each bottle the vintage (not the bottling year), Winery and wine name. Also include details as to where the wine is physically located and a brief description of how it has been stored. Unfortunately, most Australian ports have come down in value over the past few decades. 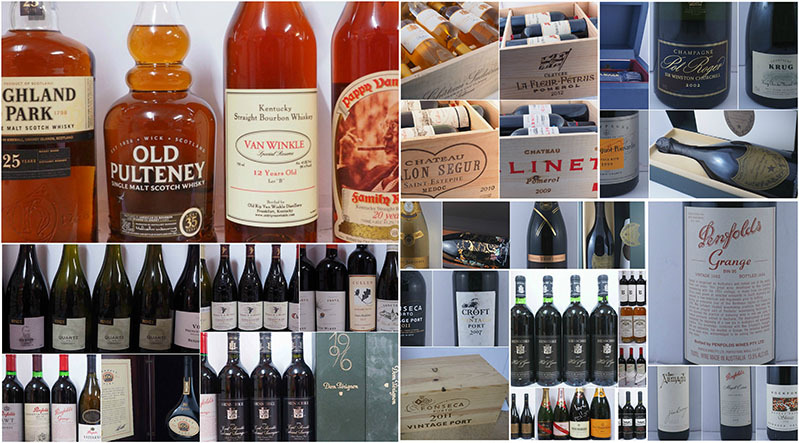 There are only a few that attract value at auction such as Penfolds and Seppelts Ports as well as vintage ports prior to 1970. Understandably, the domestic Australian market is dominated by locally produced wines which affects the prices paid for overseas wines and the number of people interested in purchasing imported wines. Subsequently you should not expect the same prices selling good quality Bordeaux, Burgundy and Champagne in Australia that can be achieved in international markets. At best, you can expect to get back a little less than what you paid for them at release. For a complete list of valuable and popular Australian wines and how we determine value see our pricing index. Google+ Copyright ©2017 Mark Wickman, All Rights Reserved.